Place the potatoes into a saucepan and fill with enough water to cover. Bring to a boil, then cook over medium heat until tender enough to pierce with a fork, about 10 minutes. Drain and mash with butter and milk to your desired texture. Meanwhile, crumble the ground lamb into a large skillet. Cook and stir until no longer pink. Season with Worcestershire sauce and beef bouillon. Add the mushrooms and onion; continue to cook and stir until tender. Transfer the contents of the skillet to a large casserole dish. Mix the baked beans, diced tomatoes, gravy mix and carrots in with the lamb. 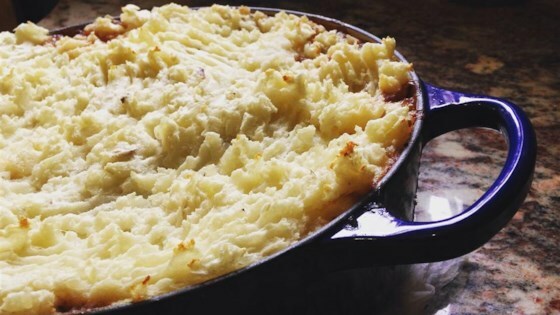 Dollop big blobs of mashed potatoes over the top and carefully spread evenly to cover the entire top. Rake over it with a fork to create a crispy texture on top when it browns. Bake for 10 minutes in the preheated oven, until the top is browned and crisp. Very nice...lamb is the original Shepherd's pie...hence the word Shepherd...thanks! Very liquidy but good - might pass on the baked beans next time in lieu of green beans, personal preference. Kids loved it (over and over again...made a LOT of food). Great flavor!